In order for a union organizer to be successful, (s)he must trick employees into believing that, whatever their issue, the union will solve it. In fact, a union organizer's promises are nothing more than...promises. And, unfortunately for the employees who believe a union organizer, union promises are not guarantees. Union organizers are legally allowed to make employees promises, even though they have no ability to guarantee those promises. [Read why here.] 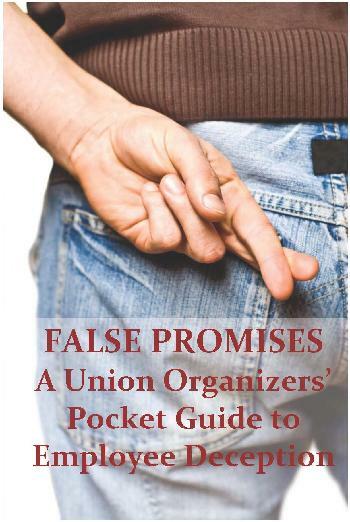 If employees believe a union organizer's promises and become unionized based on those promises, there is nothing the employees can do if the union later breaks its promises or fails to live up to the employees expectations. In many cases over the years, the National Labor Relations Board has affirmed a union's right to make promises, even though the union could not guarantee them because, in the view of the NLRB, employees are not naive enough to believe all that they are told in the course of a union campaign. The sad fact of the matter is, union organizers are creative in the way they make promises and many employees fall for false union promises all the time. To read more, go here.